Learn about Google Adwords’ new “Display Network” Tab! The Display Network tab was launched in late March and allows you to view your Display targeting in one central location. Previously, you would need to click separate tabs for Display Network targeting. Areas such as “Networks,” “Audiences” and Topics” were all separate tabs, thus adding extra clicks to the setup and review process. Now, all of these targeting methods are located in the Display Network tab. An extremely relevant feature in the Display Network tab is the new targeting diagram. This diagram allows you to visualize how all of your targeting works together and the potential reach your ads will receive. For example, say you are creating a campaign around baseball gloves. To make the campaign as specific as possible you create ad groups around: “baseball gloves,” “first baseman gloves,” and “catchers’ gloves.” Each ad group contains highly targeted keywords with very specific text ads. Along with your keywords, you also want to show these ads on highly relevant placements. 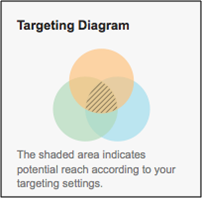 The targeting diagram would then show two circles with a shaded area for keywords and placements. In other words, your ads will only show on placements you target that utilize the specific keywords. Instead of flipping from tab to tab, you can choose and visualize your targeting in one central location! Over the years, Google has done a good job refining Display Network targeting. From adding the ability to target keywords to creating remarketing, the Display Network has come a long way. It only makes sense then that display would get a better and more functional interface within AdWords. At Exclusive Concepts, we are very pleased with the Display Network tab. With all of the facets of display, effective management becomes that much more important. The fact that we don’t have to waste time with extraneous clicks and we can view targeting options holistically is a huge plus.